Tree-Killing Bug Spreads Through NC. Let’s Help Stop It. 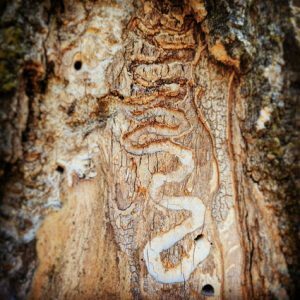 | CS Tree Services, Inc.
What is the emerald ash borer (EAB)? 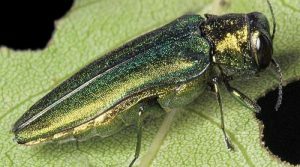 The emerald ash borer is a metallic green beetle that bores into ash trees feeding on tissues beneath the bark, ultimately killing the tree. It is not native to the United States and was first found in the U.S. near Detroit, Michigan in 2002. EAB is now found in many of the Midwestern and eastern states and has already killed tens of millions of ash trees. It has been found in 25% of North Carolina counties, including the Triangle area. If you suspect your ash tree is infested, contact a certified arborist and then alert a forest ranger if your ash tree is affected. Infested trees can die within 5 years, but small infestations can be treated with pesticides. EAB infestations can also be prevented through pesticide treatments done by a certified arborist. How does it kill a tree? Adult beetles lay eggs on the bark of ash trees. 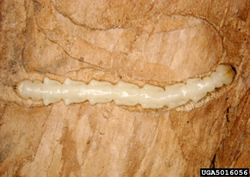 When the eggs hatch, the larvae (immature beetles) bore into the bark and feed on the transportation tissues of the tree. This disrupts the movement of nutrients and water within the tree, girdling it and causing tree death. Emerald ash borer attacks all species of ash native to the United States as well as native white fringetree. The four species of ash native to North Carolina include white ash, green ash, Carolina ash, and pumpkin ash. Both healthy and unhealthy trees can be attacked. In 2014, EAB specimens were found infesting white fringetree (aka Old Man’s Beard) in Ohio. Subsequent surveys indicated this was a widespread phenomenon. Mountain ash, which is not considered a true ash, is not susceptible to EAB. The beetle is native to parts of Asia, specifically China, Japan, Korea, and parts of eastern Russia. It is believed to have been transported to the United States in wood packing materials made of ash. Where is the insect currently found in the U.S.? The emerald ash borer was first found in the U.S. in June 2002, near Detroit, Michigan. Since then, it has spread to many central and eastern U.S. states and parts of eastern Canada. 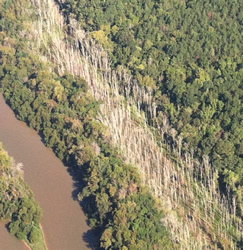 In 2013, the emerald ash borer was found in Granville, Person, Vance, and Warren counties in North Carolina. In 2015, it was found in many additional counties. The NC Forest Service tracks its movements and its current range in NC is continually updated. EAB can spread naturally by flying to new host trees upon emergence, but this dispersal is limited to a few miles a year. The more threatening spread is that of long-distance dispersion, which can easily occur when a beetle is accidentally transported from an infested area to an uninfested area by the transportation of ash wood products by humans. The spread of EAB to Tennessee and Virginia, including detection sites in counties adjacent to North Carolina, is believed to have been accidentally facilitated by humans. Will EAB kill all of the ash trees? It is too early to tell, but many believe that mortality may be similar to what has been seen with hemlocks (affected by hemlock woolly adelgid) and American chestnuts (affected by chestnut blight). The emerald ash borer has already killed tens of millions of ash trees in the United States and threatens to kill many more as its range expands. Research to manage the beetle is ongoing and the best management plan for now is to minimize its spread while seeking a permanent solution. Why are ash trees important? Ash wood is greatly valued for its strength and elasticity and is often used for baseball bats, bows, tool handles, and other products that require durability, strength, and resilience. Green ash is planted widely as a landscape tree in urban areas and is a valuable native component of wetland areas. Ash foliage and seeds are fed upon by numerous animals as well as butterfly and moth caterpillars. How long does it take for a tree to die? Within 2 years of observing symptoms, most of the crown of the tree will be dead. Complete tree death typically occurs within 5 years, but may take as few as 2-3 years. D-shaped exit holes, made when EAB emerges from the tree as an adult. What does a tree infested with the emerald ash borer look like? Initially, the top of the crown begins to thin and partially die. Epicormic sprouting, or sprouting from the main stem of the tree, may occur. The presence of insects below the bark leads to increased woodpecker activity, which causes the tree to look like it is losing patches of bark. In severe cases, the bark of the tree may split in places where the larvae are feeding beneath. Direct evidence of the beetle can also be seen. 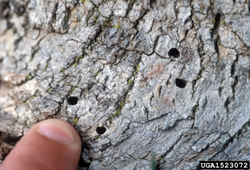 Small, 1/8″ D-shaped exit holes, where adult beetles emerged from the tree, will occur wherever a beetle emerges. This may be above eye level, so it is important not to discount a symptomatic tree if no exit holes are observed. 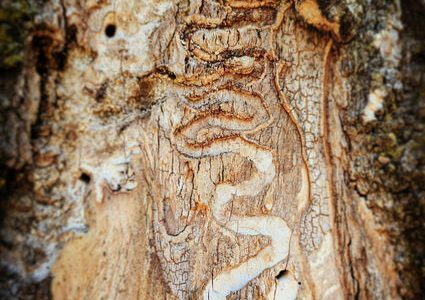 If the bark is peeled back, the galleries where larvae have fed may also be observed; they are meandering and are usually filled with frass (sawdust and insect excrement). Larvae may also be visible underneath the bark. The cream-colored larvae have bell-shaped segments and can be up to 1.25″ in length. The Emerald ash borer leaves distinctive tunnels. What do the beetles look like and when can they be found? Adult beetles are a striking metallic green color, about 1/2″ long and 1/8″ wide. If their wing covers are pried up, their bodies underneath are a metallic purplish-red color. In North Carolina, the adult emerald ash borer is expected to be active in the late spring, likely April through June. Emerald ash borer larvae may be found under the bark of the tree throughout the year. Currently, there are few options to protect or save trees from the EAB in a forest environment. The best option for most ash trees is to quickly detect the presence of EAB in new areas and destroy affected tree materials. Cut down dead and dying ash trees and chip, burn, or bury the wood on the site, in accordance with all local regulations, to reduce the chance of other trees being attacked. The NCDA&CS has issued a statewide quarantine to prevent the human-facilitated movement of EAB to new areas. Insecticides are available for those wishing to protect high-value ornamental trees, an option recommended when the beetle is known to be within 15 miles of the tree. If a tree is already infested and over half the crown is still alive, insecticides may be used therapeutically to help trees recover. Recovery is slow and improvement in tree health might not be noticeable for one to two years. Re-treatment must take place every one to two years. Three species of stingless, parasitoid wasps native to China have been reared and released in many of the states where EAB has been found. The wasps attack either the egg or larva of EAB, killing it. The goal of this biocontrol program, run by USDA-APHIS-PPQ, is to establish populations of these wasps in areas where EAB occurs so that they may help manage EAB populations and reduce ash mortality. An intensive environmental impact study by USDA found them to have “no significant impact.” In September 2013, the N.C. Forest Service began releasing parasitoid wasps at three sites in Granville County. An additional site in Wayne County was added in 2015. Wasps are released monthly at these four sites. Communities should identify their ash resource with a public tree inventory. Without a public tree inventory, it is difficult to evaluate how the EAB will affect your community. A purple prism trap, designed to trap EAB, hangs from the branch of an ash tree. What counties are quarantined and why? In September 2015, a statewide EAB quarantine went into effect in North Carolina. This means that any part of an ash tree, the insect itself, and all hardwood (deciduous) firewood cannot be moved from a quarantined area into an area outside the quarantine. Firewood refers to wood that is cut to less than four feet in length. With a statewide quarantine in place, these materials may move freely within the state, but cannot be moved into adjacent states’ non-quarantined areas. While moving firewood within N.C. is legal, the N.C. Forest Service encourages the use of local or treated firewood to reduce the spread of invasive pests. 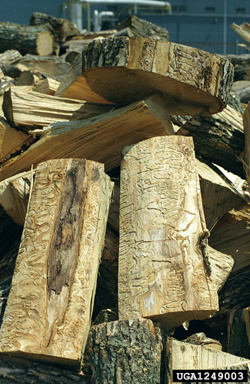 How can moving firewood and other wood products spread the insect? Beetles bore into ash wood as very small larvae, leaving no visible entry points. Therefore, it is difficult to tell if wood is infested before the adult emerald ash borers emerge. Any beetles living in wood can emerge during transport or at the final destination and attack new trees in the new location. This is most readily done through the transportation of firewood and wood packing materials. The primary focus right now is to prevent further spread of this insect, especially spread facilitated by humans. Don’t move firewood or other unprocessed ash wood products out of areas where emerald ash borer has been detected or is suspected to be present. Use local firewood or wood that has been debarked, heat treated and inspected. A good rule of thumb is to burn firewood within 50 miles where it was cut. With emerald ash borer found in North Carolina, should landowners harvest all of their valuable ash timber now? The natural spread of emerald ash borer is fairly slow. If someone is growing ash on their property, they should monitor their trees for signs and symptoms of emerald ash borer. As long as trees are healthy and growing, and not under imminent threat from the insect, they should continue to be managed according to a forest management plan. If ash trees are found to be infested, a salvage harvest should be considered. Emerald ash borer damage is primarily confined to the outer portions of the tree, so affected trees may still be valuable for lumber and other wood products if detected early and processed quickly. For areas within the quarantine, all parts of any ash tree harvested must remain within the quarantined area. That means harvested materials can only be left on site or transported to locations inside of the quarantined boundaries. This applies to both infested and healthy trees. Harvested ash wood can freely move from a non-quarantined area into the quarantine boundaries. With a Compliance Agreement with NCDA&CS Plant Industry Division, ash material may leave a quarantine zone if specific treatments to the wood are applied. How can one find out how much ash trees on his or her property are worth? In a forest setting, a consulting forester can appraise tree and stand values and help with the marketing of your timber. Some consulting foresters work in urban areas and may be helpful in assessing the condition and value of yard trees. For yard trees, assessing a value may be difficult. Landscape trees usually have more limbs and poorer form than those in a forest. They may also be damaged by lawnmowers, cars, nails and other urban stresses. Yard trees can also be expensive to remove due to nearby houses, roads, utilities, and other hazards. The cost of removing a yard tree may equal or exceed its value. As long as they are healthy, urban trees’ highest value are usually as shade trees. A consulting forester or certified arborist may help you assess the value of urban ash trees, determine a treatment plan, or recommend a buyer who will give you a fair assessment. What should one do if he or she observes a dying ash tree and suspects the emerald ash borer? Please report the location and descriptions of potentially infested trees to 1-800-206-9333 or newpest@ncagr.gov. Contact your county forest ranger for diagnosis assistance and management advice. Local rangers will refer potentially infected trees to forest health or plant industry specialists. DO NOT COLLECT AND TRANSPORT WOOD SAMPLES THAT MAY BE INFESTED!